This is a list of extraordinary pigs, hogs and wild boars. In 1784-5 an unnamed pig was exhibited in London under the title The Learned Pig. The pig could spell words and solve arithmetical problems. Later Learned Pigs were exhibited under the name Toby, and were said to be able to read minds. In 1859, an unnamed British-owned pig wandered into Lyman Cutlar’s potato patch on San Juan Island, Washington, and was shot, thus setting off a (small) cold war known as the Pig War. King Neptune (May 16, 1942–May 14, 1950) was a Hereford swine used by a United States Navy recruiter to raise $19 million in war bonds for the construction of USS Illinois (BB-65) between 1942 and 1946. At least two monuments have been erected in honor of this pig and his handlers. Tirpitz was a pig captured from the German Navy after a naval skirmish following the Battle of the Falkland Islands in 1914. He subsequently became the mascot of the cruiser HMS Glasgow. Max was the Vietnamese black bristled potbellied pig pet of George Clooney, often referred to as “Max the star” by Clooney. The pig shared Clooney’s Hollywood Hills home, also Clooney’s bed, and frequently made cameos in interviews, mostly because of his size. Pigasus was a tongue-in-cheek candidate for President of the United States run by the Yippies at the 1968 Democratic National Convention in Chicago. 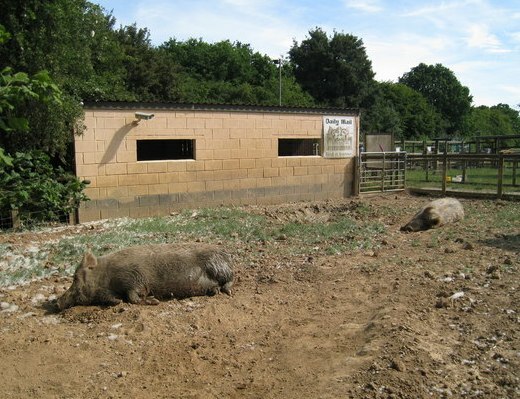 The Tamworth Two, named Butch Cassidy and the Sundance Pig, were two Tamworth Ginger pigs who escaped while being unloaded from a lorry at an abattoir in the English town of Malmesbury, Wiltshire in January 1998. The pigs were on the run for over a week, and the search for them caused a huge media sensation, as well as immense public interest, both in Britain and abroad. Maude was a pet owned by U.S. President Theodore Roosevelt and his family during his presidency (1901-1909). Khanzir is a male pig who, in May 2009, attracted international attention as the “only pig in Afghanistan“. Arnold was the Ziffels’ pet pig on the TV sitcom who would sometimes come uninvited into the Douglas home, turn on the television and watch wile sitting in a chair. Green Acres. Snobben was a Norwegian pet pig that received national attention when the owner’s car was stolen in 2001, with the pet pig inside. The car was found five days later, with the pig in good shape. At the time Snobben was already known locally in Oslo, where he during the late 90’s was often seen doing the groceries alone at Majorstuen. In this photo released by Melynne Stone, Jamison Stone, 11, poses with a wild pig he killed near Delta, Ala., May 3, 2007. Stone’s father says the hog weighed a staggering 1,051 pounds and measured 9-feet-4 from the tip of its snout to the base of its tail. If claims of the animal’s size are true, it would be larger than “Hogzilla,” the huge hog killed in Georgia in 2004. Monster Pig is the name of a large hog killed on May 3, 2007, by an eleven year-old boy, Jamison Stone in a 150-acre (0.61 km2) low fence enclosure within the larger 2,500 acre (10 km²) commercial hunting preserve called Lost Creek Plantation, outside Anniston, Alabama. According to the hunters (there were no independent witnesses) the pig weighed 1,051 lb (477 kg). Claims of the authenticity and allegations of the kill being a canned hunt have disputed the claim. Hogzilla is the name given to a wild hog that was shot and killed in Alapaha, Georgia, on June 17, 2004, by Chris Griffin on Ken Holyoak’s farm and hunting reserve. Alleged to be 12 feet (3.6 m) long and to weigh 1,000 pounds (450 kg), scientists confirmed that Hogzilla actually weighed 800 pounds (360 kg) and was between 7.5 and 8 feet (2.25 and 2.4 m) long, diminishing the previous claim. On January 5, 2007, a 1,100 lb (500 kg) feral hog was shot in Fayetteville, Georgia. The shooter was William “Bill” Coursey, who hung the specimen from a tree in his yard. Neighbours reported that the animal had been seen in the neighborhood several times over the preceding days. A spokesperson from the Georgia Department of Natural Resources said that large boars and feral hogs were common in southern Georgia, but that no records are kept on them. The media latched on to the notion that this animal rivals the size of Hogzilla. Hog Kong was an estimated 1,140 lb (517 kg) wild hog killed in August 2004 by Larry Earley at his 22-acre (89,000 m2) farm near Leesburg, Florida, using a Smith & Wesson Model 29. The world record for the heaviest pig so far is held by Big Bill, owned by Elias Buford Butler of Jackson, Tennessee. It was a Poland China breed of hog that tipped the scales at 2,552 lb (1,157 kg) in 1933. Bill was due to be exhibited at the Chicago World Fair when he broke a leg and had to be put down. At about this point in time, the trend in hog production began to shift to hogs that were much trimmer and very lean. Ton Pig was a domestic hog from China owned by Xu Changjin that weighed in at 1,984 pounds (900 kg). Ton died from lack of mobility because of obesity on February 4, 2004. It was sent to the Liaoning Agriculture Museum in Shenyang, for display. Big Norm was owned by Robert Peterson. Even though Norm got regular hog feed, he started to grow to freakish proportions. A cooperative extension agent was able to calculate Norm’s weight at 1600 lb (730 kg) and he was 8 ft (2.4 m) long, and 4 ft (1.2 m) high.